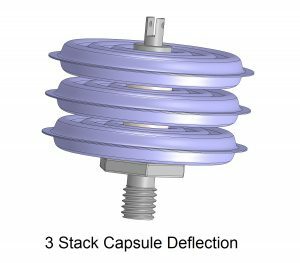 This is a three stack capsule deflecting with internally applied pressure. Shown is a 125 Series assembly with a 1.125 inch outer diameter. Deflection is 0.150 inches. 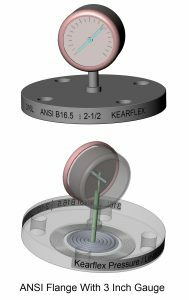 By manipulating the diaphragm design, this capsule can provide the same full scale deflection with an applied pressure of 0-15 Psi through 0-100 Psi. 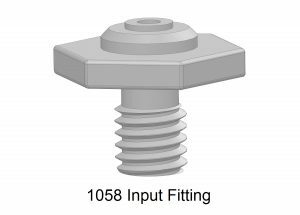 This allows a single assembly form factor to be used interchangeably in a product with a range of pressures. This is a three stack capsule showing the construction. The input fitting (bottom), spacer, and output fitting (top), are all customized for the specific application. 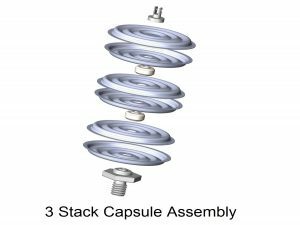 By varying the dimensions of these components, the overall stack height of the assembly can be manipulated to adapt to the next level assembly. Shows 1, 2, and 3 stack assemblies. Can be used with a very sensitive diaphragm allowing setpoints as low as 6 inches of water column. Superior for tank overfill detection or containment vessel leak detection. 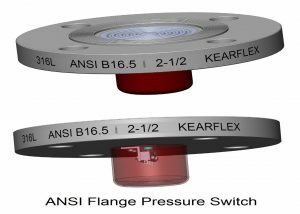 With a stiffer diaphragm the switch can be set for levels up to 50 feet of water column. Can also be used to monitor process pressures from inches of water to 250 Psi. Can be used with a very sensitive diaphragm allowing indication as low as 2 feet of water column. With a stiffer diaphragm the gauge can be used for levels up to 50 feet of water column. Can also be used to monitor process pressures from 1 Psi to 250 Psi.